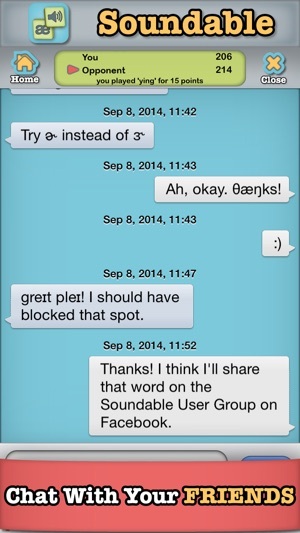 Soundable is a fun, social crossword game with a twist…. you use SOUNDS to build words instead of letters! “WORDS” becomes “W-ER-D-Z” when you play with the 41 different sounds in North American English. 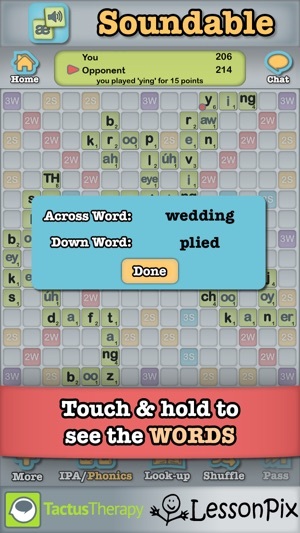 No need to be a good speller to play this game! Soundable makes learning the International Phonetic Alphabet (IPA) fun for students & professionals in Speech-Language Pathology. It’s also perfect for students of linguistics, phonetics, speech disorders, or English as well as people generally interested in language. Look up words in the dictionary before you play, and appeal words you think should be in the dictionary. Your opponent will get to decide if your sounds make a valid word. 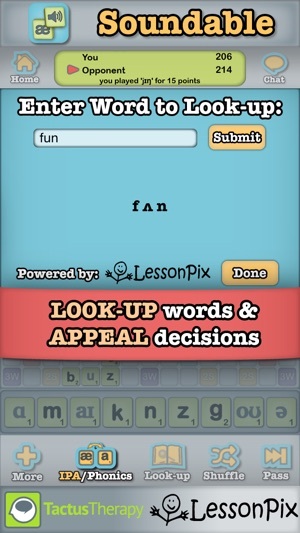 Successful appeals will be reviewed regularly and added to the dictionary, so the more you play, the better the dictionary gets! 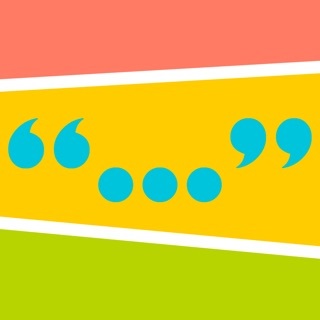 Earn bonus points when you create words longer than 3 sounds. Be the first to hit 200 points in the Quick Game format, or stay in for the long-haul to play every tile in the bag in the Full Game. Play against your friends or a random opponent. 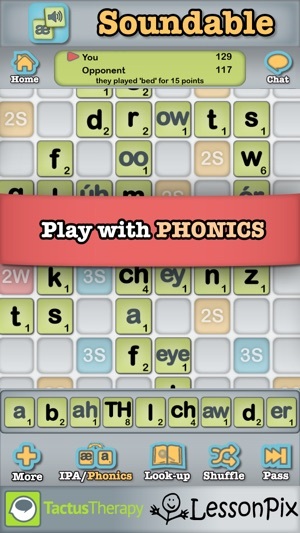 Whether you play in IPA or Phonics, you’ll have a great time challenging your friends to a battle of the ear. After you learn a few simple conventions, you’ll be building words with ease. 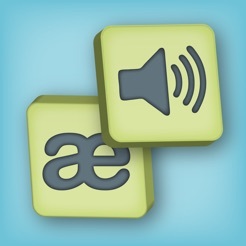 Soundable also has a built-in chat platform with a specialized IPA and Phonics keyboard. Now you can talk about the words you appeal, discuss the board, or congratulate and/or trash talk your opponent within the app. You can also discuss the game, share screenshots, and find players in our Soundable Users Group on Facebook. Please note: Soundable uses Standard North American pronunciation. UK, Aussie, Kiwi, and South African players may get frustrated as vowels (and r’s) do vary by accent. Regional variations of American/Canadian English may be appealed and accepted. Wifi or data connection is required to play Soundable. This app is completely free, so please tell your friends and support the sponsors. Please let us know what you think by leaving a review or contacting us. Brought to you by LessonPix (lessonpix.com) & Tactus Therapy Solutions (tactustherapy.com) – trusted sources for custom learning materials and quality speech therapy apps. If you previously logged in using Facebook, you will need to migrate your account to keep all your games. Downloaded this an hour ago - instantly addicted! 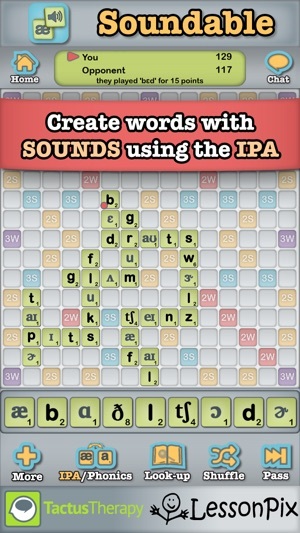 As a word nerd, phonetic freak, and speech-language pathologist - this application is feeding my addiction to IPA phonetic transcription that I had been missing since college! This is a must-have for those who are learning the IPA alphabet for speech-language pathology or any other linguistic reason! If I had this in grad school, I would have been incredibly competitive with my studying! 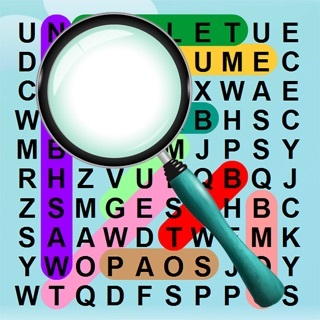 You can switch between IPA/phonics, look up words, shuffle and swap tiles in this word game - and the best parts are if you press on a phoneme, it will say it aloud and if you press and hold on a word, it will show it spelled out! I can see myself challenging my other SLP friends! 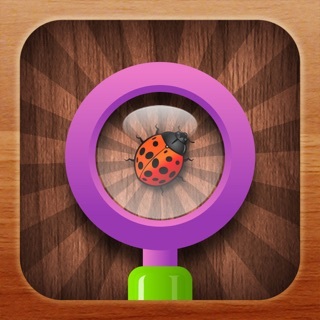 This app not only helps you practice IPA it is a great brain exercise! I'm enjoying playing others from all over the country. Be sure to join the Soundables Users group on Facebook to find other players. Seemed simple at first, but it is quite challenging! It's different to look at words by sound and requires thought to create words with more than 3 sounds! I recommend it, even for non-SLP people like me. © Tactus Therapy Solutions Ltd.